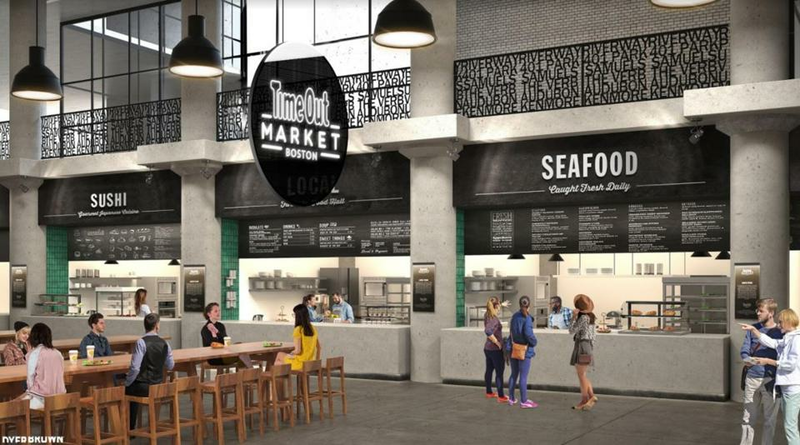 An artist’s rendering of what we can expect when the Time Out Market opens at the Fenway’s former Landmark Center this year. An array of notable chefs will be part of Time Out Market, a food and cultural center scheduled to open this spring at the former Landmark Center in the Fenway (401 Park Drive). The inaugural lineup includes Tim and Nancy Cushman (Hojoko, O Ya); Tony Maws (Craigie on Main, Kirkland Tap & Trotter); Michael Schlow (Tico); and Peter Ungár (Tasting Counter). The Cushmans will operate two kitchens at the market, blending O Ya’s high-quality sushi with Hojoko’s casual spins on Asian food. Rob Wong, Hojoko’s chef de cuisine, will oversee those kitchens alongside Tim Cushman. Maws will focus on his signature, limited-edition Craigie burger at the market, which will inspire other burger variations. And Ungár will focus on creative, locally sourced dishes similar to those at his Somerville destination: lettuce-brined black sea bass with macadamia and lemon verbena; rice-smoked duck with fermented red chili and black lime; elderflower peaches with preserved lemon shortbread — in other words, not typical food court fare. There will also be a branch of the South End Armenian-Lebanese restaurant Anoush’ella, which will serve mezze such as hummus, baba ghanoush, and kofta wraps. Union Square Donuts will also open a Time Out outpost. The market is to be launched this spring, following the 2014 debut of Time Out Market Lisbon. Time Out is primarily known as a media company, with city guides that cover 315 locations in 58 countries, from Europe and Asia to the Middle East and North and South America. Time Out Market’s chief executive, Didier Souillat, said that critics “tested, tasted, and reviewed the best food Boston has to offer” to curate the lineup. The brand will announce more vendors in coming months. Ultimately, the market will host 15 restaurants, two bars, a demo kitchen, and a retail shop. “Time Out Market isn’t just a food hall — it is the world’s first food and cultural market based wholly on editorial curation,” Souillat said in a statement.